Contact form is responsive, hidden behind the tab on the left or right side of the screen, and it is sliding into the screen when user clicks on tab. Depending on the screen size, width of the form will get smaller, and if needed, vertical scrollbars will appear. Form has validation built in for fields that are required, and it can have from 3 to 14 fields displayed. Plugin is ideal for most websites where you need simple way for visitors to get in touch, using effective slider method to hide the contact form. You can use style builder to create new styles from scratch, or start from starter styles that are included in the plugin package docs folder. You can create styles with transparency, changed fonts, all changed colors and more. No knowledge of CSS is needed to use the style builder. Integration with MailChimp for newsletter subscribe feature. Slider is responsive and works well with small screens. 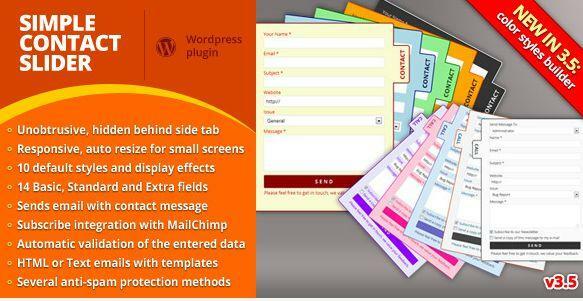 Includes 10 default schemes for slider tab and contact form. Easy to use style builder to create new color styles. Change screen location and vertical position for slider tab and form. Change size of the slider tab with different width and height. Display effects rounded edges and shadows. Control on what website pages you want contact slider displayed. Customize all labels and messages displayed in the contact form. Customize HTML and Text email templates for sending messages. Uses NiceScroll JS plugin for nice and touch ready scrollbars. Uses spin.js plugin for waiting animation without animated gif. Tools to export and import all plugin settings. When visitor fills in and sends the contact form, plugin takes the data and creates email that is sent to you (to any email you provide in plugin settings). Plugin is not saving any contact messages into database. Based on the Anti-spam settings, submissions are checked for spam and filtered out if needed. Honeypot and Referrer traps can gather IP’s from detected bots and prevent them from accessing the contact form in the future. Share the post "Simple Contact Slider"